Children Below 8 years not Allowed. No admission while scene in progress. Cameras, mobile phone etc. not allowed. 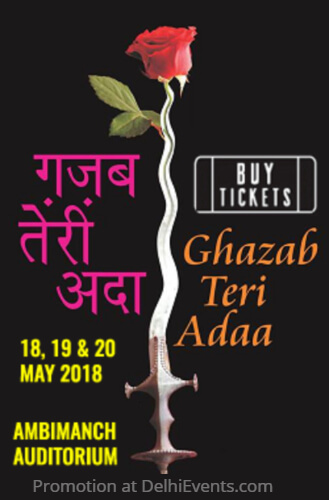 Ghazab Teri Adaa is inspired by Aristophanes’ Lysistrata. The action of the play takes place in an imaginary time and place. It revolves around the never ending aspiration for the expansion of kingdom and is a constant battle for the continuous fights in the battle field. The groups of performers make the king aware about the future of the war. The fearful king rejects to see and understand the situation. All the women, with fear and pain get together to stop the war under the leadership of Laya. They think of various alternatives to stop the war and finally decide that they will not allow their husbands to maintain any physical contact with them until the war stops. The violence-loving king and his war-loving soldiers break down in front of this unique, peaceful and non-violent protest by the women. While I was studying at NSD, I read Aristophanes’ Lysistrata in which the unusual idea of women in opposition of the war left a great impact on me. The thought of doing this play came across my mind many times in the last thirty years but it remained only an aspiration. The recent change in the global scenario, especially in the last two decades, in the name of war saddened me. So, the thought of doing this play re-occurred. The central idea of the play i.e. the revolt of the women folk against the king’s ambition of ruling the world and emerging as a supreme power, led to the initiative of creating a new play. Gender equality is another important aspect of the play. Even after sixty five years of independence, the women reservation bill has not been passed in the Indian parliament. The form of dialogue is poetic, as this play is stylized, not realistic. The language is guided by gender. In various rural dialects of the country, women often speak like men. There is no room for women in the language especially, in the plural construct, the language remains masculine. While speaking the gender dignity shatters. Besides the narrative style, the audience will also experience a varied audio-visual design.